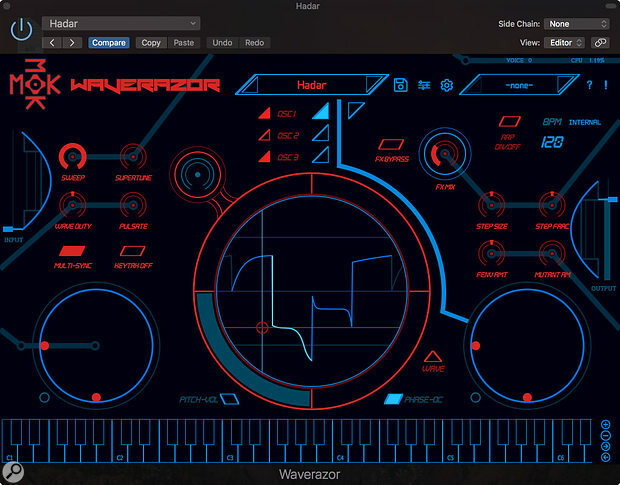 Waverazor is a nasty piece of work — but I mean that in a very positive way. 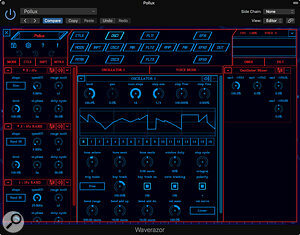 It is a three‑oscillator waveshaping synth with few visible ‘top layer’ controls that relate to the normal world of synthesis, but it is capable of serious attitude because of the way the user can interact with the various waveforms to literally slice them to pieces and then reassemble them in harmonically diverse ways. An arpeggiator adds to the controlled chaos, as does an effects section and a couple of X‑Y vector control areas that allow direct interaction with deeper sound‑shaping parameters. Perhaps the best way to begin is by opening the Quick Start manual and looking around the slightly ominous red and blue on black main plug‑in window. In the centre is a dynamic oscilloscope‑style waveform display that can view either individual oscillator waveforms or the composite output waveform produced when all three are added together. Above it are three red triangles for turning the individual oscillators on or off and three blue ones for selecting which one to view. Another triangle just to the right selects the overall view. When you’re in the individual oscillator view, the outer sections of the waveform viewer ring allow you to select different sections of the displayed waveform, as chosen using the red Wave triangle button plus the two small button outlines that appear at the bottom of the Waveform display in this mode. The selected segments, which vary in number depending on the preset, are highlighted and can be adjusted using the X‑Y cursor in the centre of the crosshairs display after clicking either the Phase‑OC or Pitch‑Vol buttons. These allow the selected segments to be changed in level and their phase to be adjusted, all independent of the rest of the waveform. It all makes more sense when you can see it, but the key point here is that all these manipulations tend to leave the waveforms with abrupt steps in them so they become harmonically very complex. 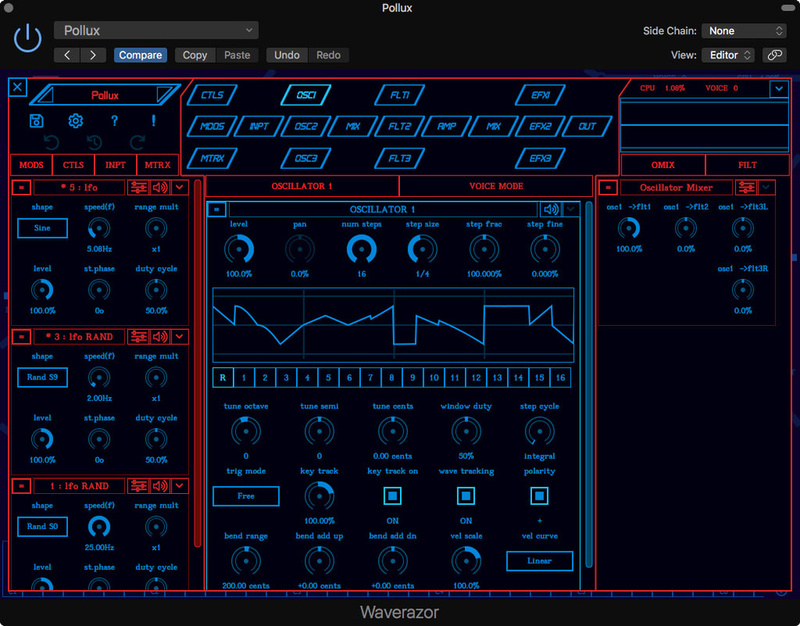 Using the two vector pads, which respond to DAW automation, to interact with the oscillators produces effects reminiscent of oscillator sync, ring modulation and FM programmed during a hangover. The arpeggiator adds to the fun and also makes rhythmic patterns possible. The four knobs and two buttons above the left‑hand vector pad are different for each preset, and if you are brave enough to jump to the Editor window, you can burrow so deeply into Waverazor that you may never find your way out again. The Editor manual contains over 100 pages detailing the parameters. At the top of the editor page are 17 buttons arranged in the order of signal flow, each of which takes you to a different page relating to oscillators, envelopes, modulation, multi‑mode resonant filtering, effects, mixers and so on. The layout may be logical but there’s so much you can dig into that it can get scary. The Oscillator 1 screen: just one of many, many more editor pages.Fortunately, the main ‘top layer’ controls along with the Waveform‑torturing capabilities means that you can explore some very extreme sounds without ever going down the rabbit hole of the deep editor pages. The factory presets make a good jumping‑off point and the Quick Start manual is there to guide you. As a first step I’d recommend playing with the tools that replace and/or reshape the oscillator waveforms on the main page. You can replace sections of waveform segments, tweak frequency and loudness, and adjust both phase and DC offset. Further sonic changes can be made using the two X‑Y vector pads. It isn’t evident what’s actually being adjusted without reverse‑engineering the presets in the editor section, so just move things and see what happens. The Mutant AM knob on the left also introduces some very ring modulator‑like effects. And if you turn off KeyTrk, things definitely take a bus out of Kansas on their way to the Atonal city. Using these few tools to modify the factory presets will give you a pretty good idea of the scope of sounds you can expect. Despite the labyrinthine editing possibilities, the sounds available from this synth definitely lean in a specific direction, many reminiscent of early Radiophonic Workshop Doctor Who background music. Words like gritty, buzzy, electrical, doomy and even Germanic spring to mind, so if you need something reminiscent of a light sabre carving up a corrugated iron shed in a high wind, or perhaps the Predator practicing dentistry, you need look no further. Smoother sounds are possible but to my ears they tend to sound somewhat bland in comparison with the more aggressive fare this synth excels at. The arpeggiator section can turn up some interesting if retro‑sounding rhythm parts too, some of which have a bit of a Kraftwerk flavour. 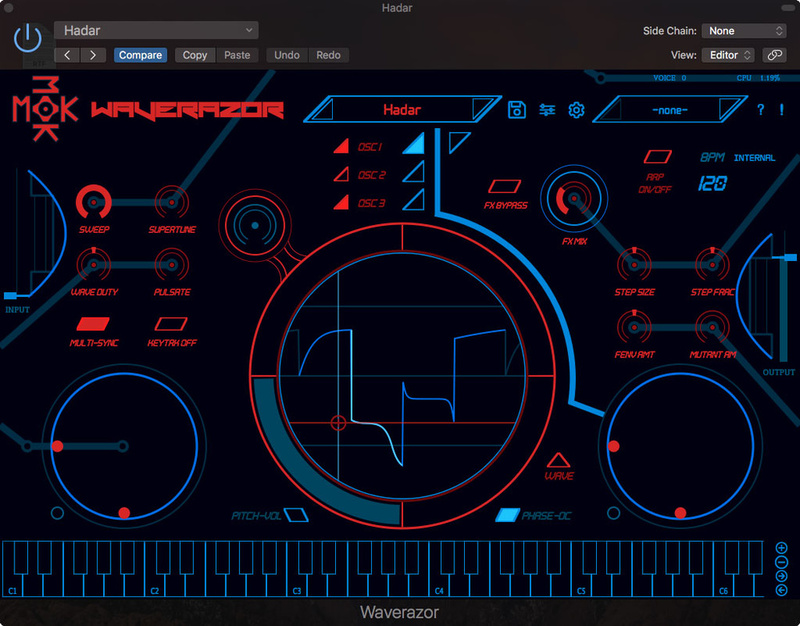 If you’re fed up with sweet and cuddly sounding synths and need something that sounds more industrial or experimental, Waverazor is definitely worth exploring — which you can do via a free time‑limited demo. Just don’t expect to master its innermost depths any time soon. Easy to change the factory presets into something very different. Deep editing requires Minotaur repellent and a ball of string. While not for everybody, Waverazor does manage to offer something out of the ordinary that can be approached on a number of different levels.